Members of The Fuller Center for Housing (FCHA) visited Vanadzor Old Age Home (VOAH) during their recent trip to Armenia. The group, which was headed by FAR Board Member Father Yeprem Kelegian, [https://armenianchurch.us/clergy-profile/?smid=1848 ] learned quite a bit about VOAH’s residents, their routines and even their hobbies during the eye-opening visit, which also enabled them to directly see how gifts and donations help to relieve the burdens of VOAH residents as they age. Lisa came to Armenia with five of her eight kids. 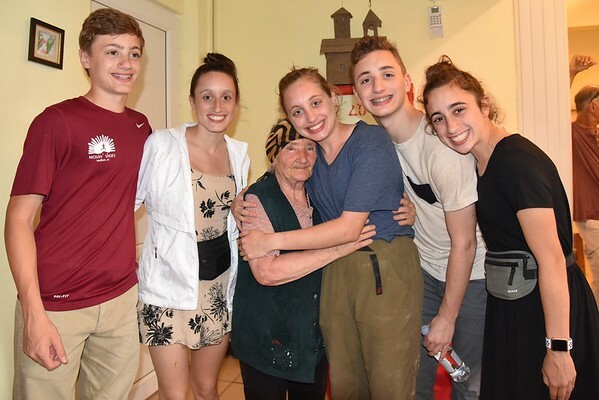 “I want them to see the connection to the old and to the young, and to understand how important it is to take care of their parents later on, if they can,” she said, smiling and added that she will bring her other three kids to Armenia on her next trip so that they may also understand the importance of giving back. Visitors said they would treasure the day in their hearts. “The joy and the warmth I witnessed at the old age home is vivid in my mind. Thank you to FAR so much for their presence and dedicated work,” said Father Kelegian. FCHA group members also visited the FAR Children’s Center, the Nor Nork Soup Kitchen, and GTech during their stay.